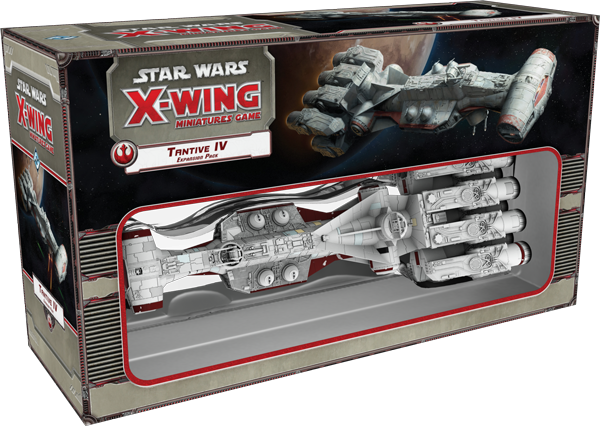 TheMetalBikini.com- X-Wing Miniatures and more: More Tantive IV Info Revealed! 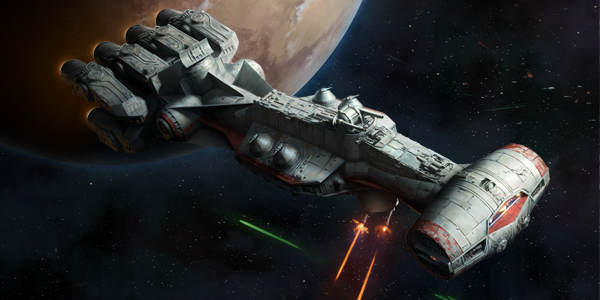 So after slacking off on the updates the past few days while I recovered from the human male version of a Chardaan Refit (aka- vasectomy), I was kinda hoping FFG would continue their relatively recent trend of releasing some X-Wing Miniatures info on Fridays. See what I mean? I'm not trying to hate on it, I'm just saying. Mission 1 has some Rebel smugglers in a CR90 fighting their way through a TIE Swarm consisting of Howlrunner and five Black Squadron Pilots (man, FFGs mad at the Swarm, huh?). Depending on how Mission 1 went, we move on to either Mission 2a or Mission 2b. 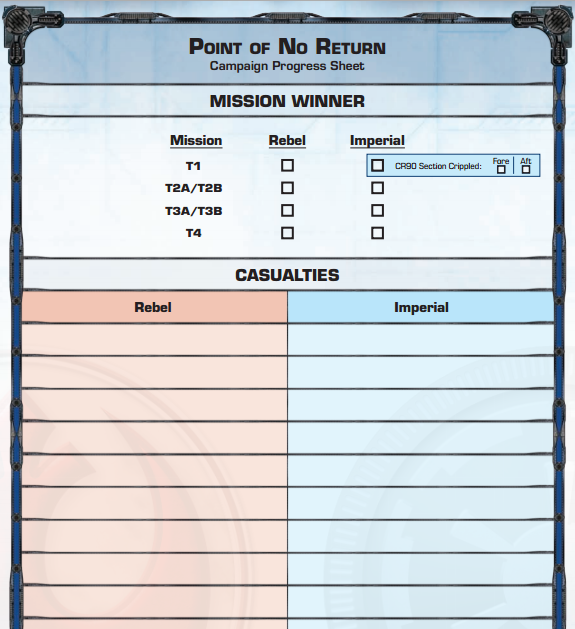 If the Rebels make it through Mission 1 "relatively unscathed", which in this context appears to be not having the fore of the CR90 crippled, they proceed to 2a which pits the CR90 against the remnants of the patrol group from Mission 1 as well as some Imperial reinforcements lead by Soontir Fel. Sounds as though if the CR90 survives for x rounds, then some Rebels turn up to help it escape to Mission 3a or 3b. If the CR90 got messed up in Mission 1, Mission 2b has her trying to reach a secret (do the Rebels have any bases that aren't secret? I mean, it's kinda redundant to talk about secret Rebel bases at this point, isn't it?) Rebel base for repairs. Of course, that all goes side ways when Captain Jonus turns up with some full tubes and some friends. Once again, FFG is a little confusing about whether this is Epic or Cinematic or a possible mix of the two, but if capitalization is important to you, it would appear that this article does indeed concern the Cinematic Game Format which is epic, but is not Epic, if you catch my drift. 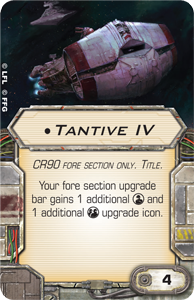 "The new campaign from the Tantive IV Expansion Pack introduces you to just one of the play experiences you’ll be able to enjoy with your CR90 Corellian corvette... Then, in the coming weeks, we’ll take a closer look at the Epic Play tournament format and explore how the CR90 might serve as the centerpiece for a couple of different squad builds." So it does appear the campaign included with the Tantive IV and the GR75 are indeed Cinematic, but dig that second part there- Epic Play tournament format? Maybe I missed a memo, but that was news to me that Epic was going to be a tournament format in the future. Pretty cool, huh? Well, assuming the Imperials get something Epic that makes it worth not just taking a dozen TIEs with Howlrunner as per usual. That'll just be more of the same. Seems like a no-brainer for 4 points, right? Is there any reason you wouldn't want to take this title? 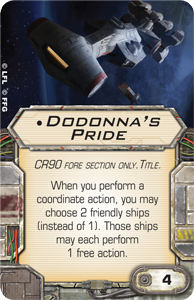 At a glance, I'd say if you're going to have buddies, the Pride might be the better choice, the Tantive title might be better if you're going it alone. Hard to say though without having it all in front of me though, y'know?